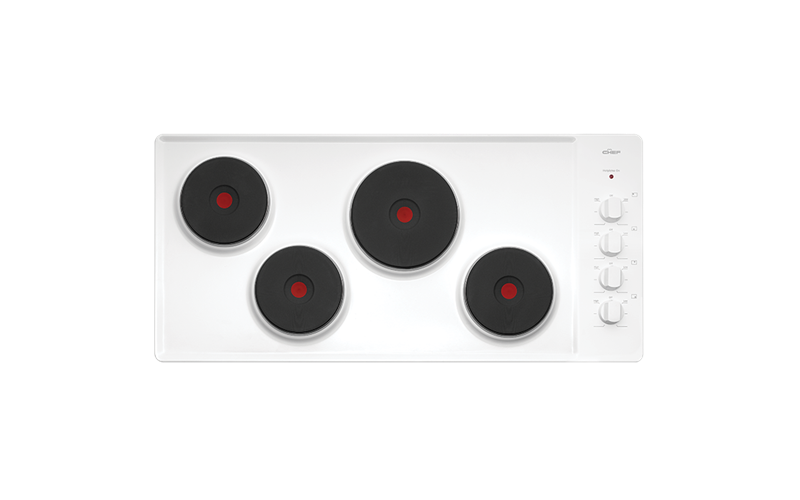 Electric 4 solid element cooktop is rated 4.3 out of 5 by 6. Rated 3 out of 5 by Sam77 from Chef stove top I bought this a month ago, and though I am now happy with the chef stove top I bought, I am not happy that I had to pay an extra installation fee as the screws that were in the electricity box of the stove top were so tight, it took an extra half hours work for the electrician to unscrew them to make it workable. I have replaced this stove top three times in my fifty year residence of my house, and this is the first time I gave had an electrician encounter this problem. I will also comment that the same electrician has fitted the last two. Rated 5 out of 5 by Chef Cooktop Buyer from Chef Cooktop I bought the Chef Cooktop a month ago due to the ceramic cooktop exploding. It was more expensive but I needed a replacement fast and the delivery and installation was a couple of days and not weeks as quoted by another company. I have had no problems with it thus far, in fact it works better and cannot shatter so that gives us peace of mind. Rated 5 out of 5 by Outbackmuma from Overjoyed! I bought this item a month ago and so glad that I did.. for almost a year my stove top on had 1 element then that busted and was using a portable. When I found this I was amazed by the price and bought it then and there. It is perfect for price and fantastic quality. Rated 4 out of 5 by Bunzy from My cooktop I r3ealloy like the quick heat but find controls a bit confusing have to be very careful to find right control. Rated 5 out of 5 by Ok la from Rangehood Good value. Right on the spot. Highly recommended.